Random Audio Sample: Central Coast: The Land and its People : music for a short documentary film by John Nottle, from the CD Selected Works by AMC Represented Artists, vol. 91. Vitality and a strong sense of contemporary connection with masterworks of the past informs the music of John Nottle. 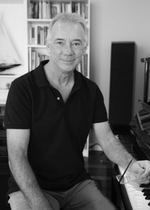 Demonstrating an adroit technique and a compositional style that is both dynamic and lyrically expressive John Nottle's music reflects his ongoing study of the artistry of past masters as well as contemporary popular music idioms. Born in Melbourne, he studied at the Victorian College of the Arts, then undertook post graduate compositional studies at the University of Adelaide and conducting studies in Central Europe. Whilst in Adelaide, he was highly regarded as an inspiring music educator. Recently, he moved to the Central Coast of NSW, where he was appointed to an orchestral conducting position at the Central Coast Conservatorium. His innovative work at the Conservatorium included the promotion of Australian composition and the first staged operas in the region, thus laying the foundations for the future development of a Central Coast Opera Company. John Nottle began composing at a young age and wrote many works in his youth. However he experienced a compositional hiatus and decided to concentrate on other aspects of music - performance, education, analysis and administration. Recently, he returned to composing and has resigned his position at the Conservatorium to concentrate on fulfilling a large number of commissions. John Nottle's compositions include works for professional, community and student soloists, ensembles and orchestras. His work Taxi! for trumpet and piano is a piece much performed by students, in examination and audition. It has also been used as a National Band Championship test piece. His cello ensemble pieces are regularly performed in America, where they have been published. In 2014 his three-movement orchestral work Triptych was premiered by the Central Coast Youth Orchestra to high acclaim from both performers and audiences alike. His works for choir have been performed internationally. THREE small GIANTS : for junior cello ensemble (2015) Commissioned by Sydney Suzuki Cello Institute. Kickstart : for cello ensemble (2015) Commissioned by Sydney Suzuki Cello Institute.